Today in the forex market the GBP (British Pound) was weak and drove a lot of price movement for traders. There were sell signals on the GBP/CHF and GBP/NZD on The Forex Heatmap®, and both of these pairs sold off. The GBP/CHF is inside of some historical support levels, so we would scale out lots on any sell positions. The GBP/NZD is in a strong downtrend on the larger time frames and should continue much lower. The live signal system you see below is The Forex Heatmap®, our live entry management system for 28 pairs, including all 7 GBP pairs shown below in the image. The GBP/CHF trading plan is presented here. This pair is trending higher on the major time frames, like the MN time frame in the image below. Traders can set a price alert at the 1.5540 resistance breakout point, then verify the buy with The Forex Heatmap®. This pair has substantial upside on the MN time frame past the 1.5540 resistance area. This trading plan was prepared using multiple time frame analysis by individual currency. This is the analytical technique we use every day at Forexearlywarning. Traders can check our website for more information on how to prepare a forex trading plan. The GBP/CHF trend analysis is shown below. On an overall basis this pair is cycling in fairly wide ranges. Set a resistance breakout alarm at 1.4900, above there it has around 400 pips of upside potential back up to the 1.5300 resistance area. When the alert hits check The Forex Heatmap® for buy entry verification. These resistance areas are marked in red on the analysis chart below. The GBP/CHF currency pair was analyzed with multiple time frame analysis by individual currency, this analytical method works for all 28 currency pairs we follow at Forexearlywarning. Today in forex trading the CHF (Swiss Franc) signaled weakness across all of the pairs in the group on The Forex Heatmap®. This drove very strong price movement on the pairs in this group. 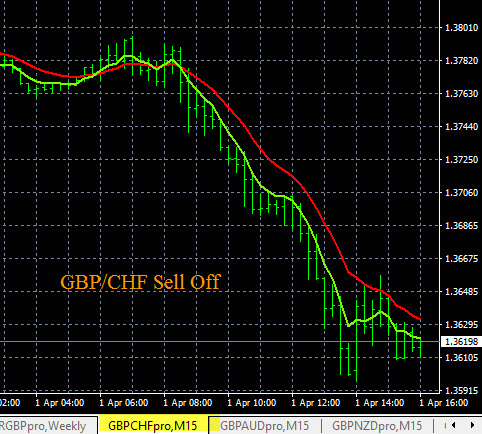 The GBP (British Pound) was also strong so the GBP/CHF had a very strong move to the upside. This pair could now continue up to the 1.4950 resistance area. Pairs like the USD/CHF also moved up and this pair could continue up to the 0.9800 resistance area. The live signal system you see below is The Forex Heatmap®, it works on 28 pairs and 8 currency groups. Today in the forex market the GBP (British Pound) strength was signaled on all pairs and this is shown below on The Forex Heatmap®. There was also EUR (Euro) weakness present, causing price movement and opportunities for traders. This caused the EUR/GBP to dropstrong to the downside, this pair should continue down to retest the 0.7050 support area as the D1 trend is forming pointing down. We will also look to the GBP/CHF pair to set more trading plans, this pair has strong upside pip potential if the D1 trend fully forms going up. The trading signals you see below are from The Forex Heatmap®, our real time trade entry management tool, it provides signals for 28 pairs. Today in forex trading the CHF (Swiss Franc) strength in the market caused price movement on all pairs in the group. There was also some GBP (British Pound) weakness in the market. This caused the GBP/CHF to move strong to the downside. This pair is trending down on the D1 time frame. This pair has minor support levels below the current pricing so it would be best to scale out some lots on any sell entries. The live trading signals you see below are from The Forex Heatmap® , it works on 28 currency pairs. Today in currency trading the Swiss Franc (CHF) signaled strength on all pairs. There was also some GBP and CAD weakness in the market. This drove the CAD/CHF and GBP/CHF strongly downward for currency traders. We would scale out lots and manage any profit on both pairs as the larger trends are not fully established on the CHF pairs at this time. The trading signals you see below are from The Forex Heatmap®, which gives live buy and sell signals across 28 currency pairs and eight major currency groups. Today in forex trading the GBP (British Pound) strength was signaled on The Forex Heatmap®. This caused price strong movement on this group of pairs. The GBP/CHF broke to the upside and has no resistance past the current pricing, it is trending higher. The EUR/GBP broke support and should continue lower in it’s downtrend. The GBP/AUD moved strong to the upside but is still inside of some resistance layers so we would scale out lots on this buy trade. The live trading signals you see below for the GBP pairs is The Forex Heatmap®, it also provides signals for seven other currency groups. Today in the forex trading the British Pound (GBP) was strong on all pairs. There was also some Euro (EUR) weakness in the market. This caused the EUR/GBP to drop. This pair is headed into support levels at the 0.7825 area. We would scale out lots or exit this trade. The GBP/CHF moved inversely to the EUR/GBP and rose strong to the upside. This pair is approaching resistance levels at 1.5350-1.5400 area. We would scale out lots at the current price levels on this pair. The currency strength indicator you see below is The Forex Heatmap®, which provides live trading alerts for 28 pairs.